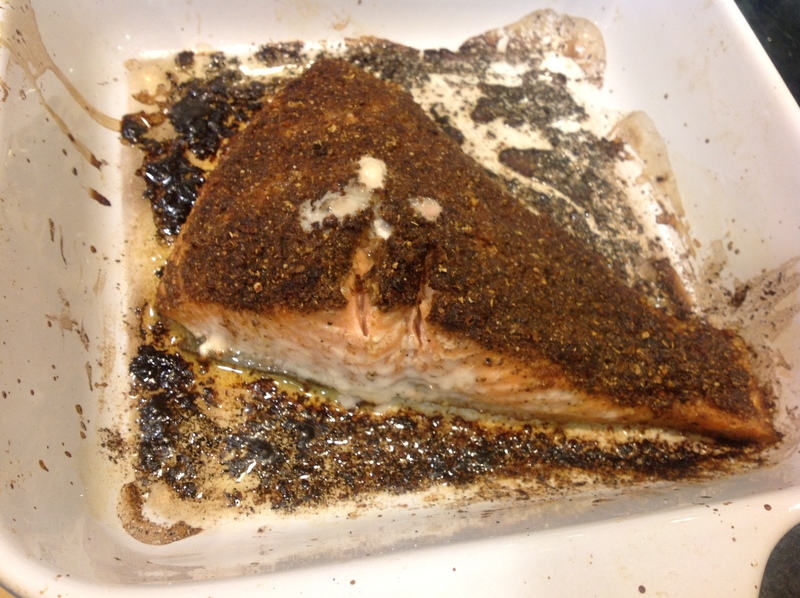 Salmon crusted with cracked black pepper is IN. Open a fancy restaurant, add that dish to your menu, and watch your cash register spin. But what is a few cracked peppers? I pooh-pooh it. Wait, I must catch a breath from laughing. I give you — salmon encrusted with the most interesting crust in the world. Black pepper does make an appearance. 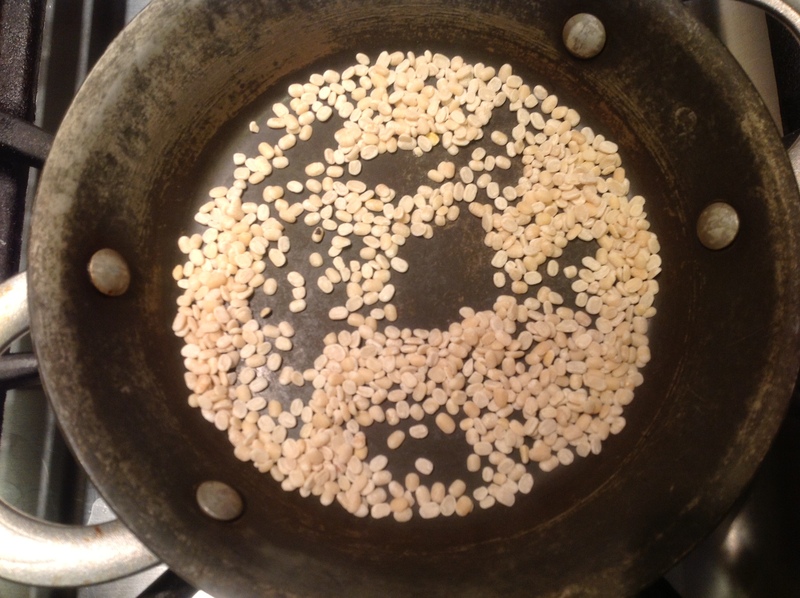 Coriander seeds do as well. 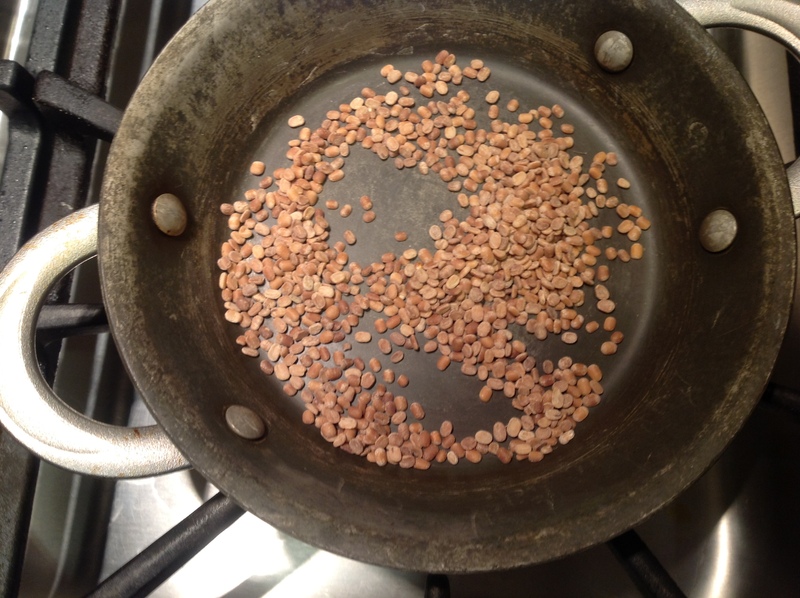 And also — that paragon of savoriness — urad dal (Vigna mungo), the platinum-blond lentils that turn red when roasted. Throw in some lemon juice and you have a meal. The fame of this recipe has spread far and wide throughout my home since I came up with it. 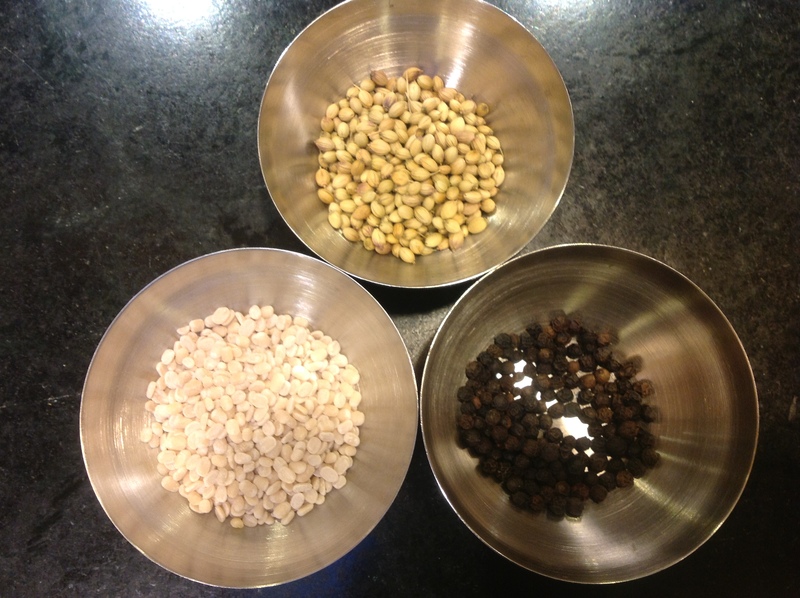 To make the spice powder we need to first roast the seeds. Heat a small thick-bottomed pan on medium heat. 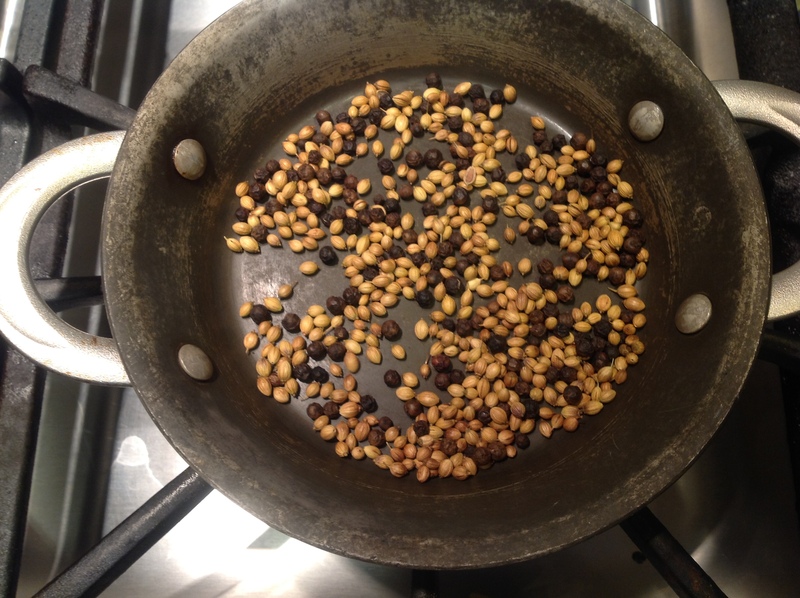 Put in the black pepper and coriander seed in one batch. Stir occasionally. In a couple minutes a few will start to pop (stand back). Empty the seeds into a small bowl. 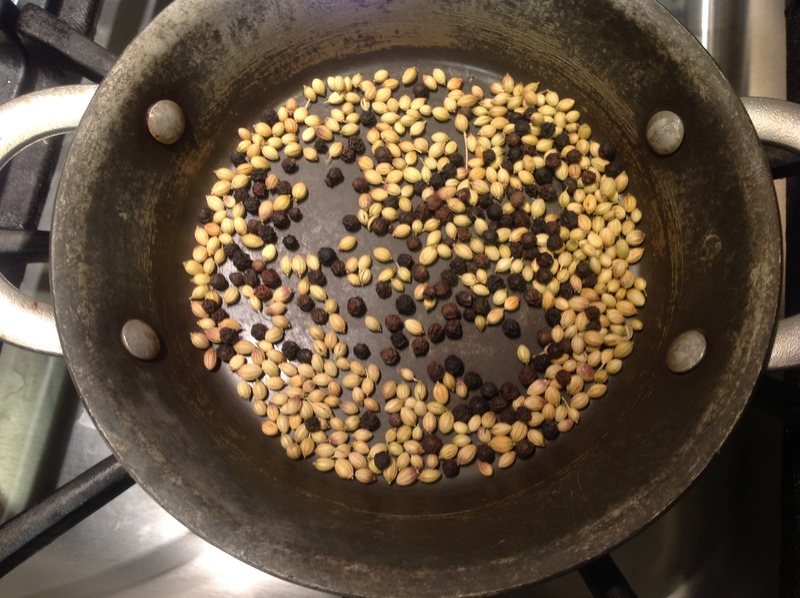 Next, in the same pan, in goes the lentil. Stir once in a while to ensure even roasting. These will take longer but in a few minutes will redden. Take them off the heat into the same bowl. 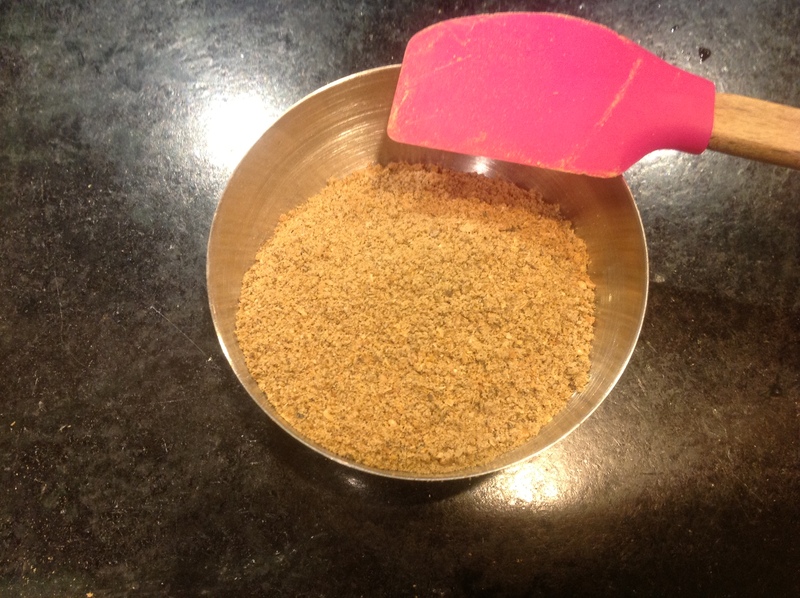 Wait a few minutes for the spices to cool, then grind them up in a clean coffee grinder. 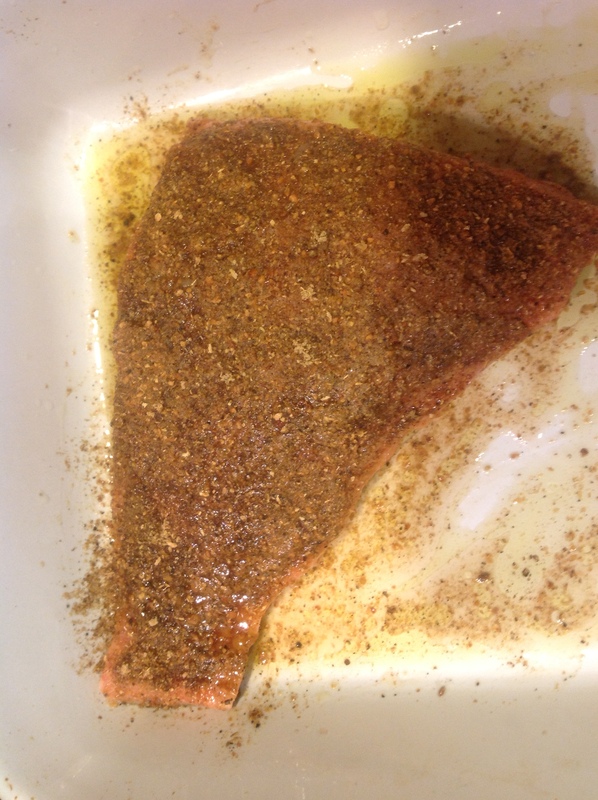 The salmon crusting spices are ready. You can save the excess in a clean spice jar, nicely labeled and dated. You will thank yourself later. Next let’s prepare the fish. For us, dinner for two consists of a three-quarter-pound fillet or steak of salmon, but feel free to use as much fish as you need. Start the oven at 425 F to preheat. Place the fish in an oven-safe tray. Make a few deep cuts with a sharp knife. Sprinkle salt to taste. 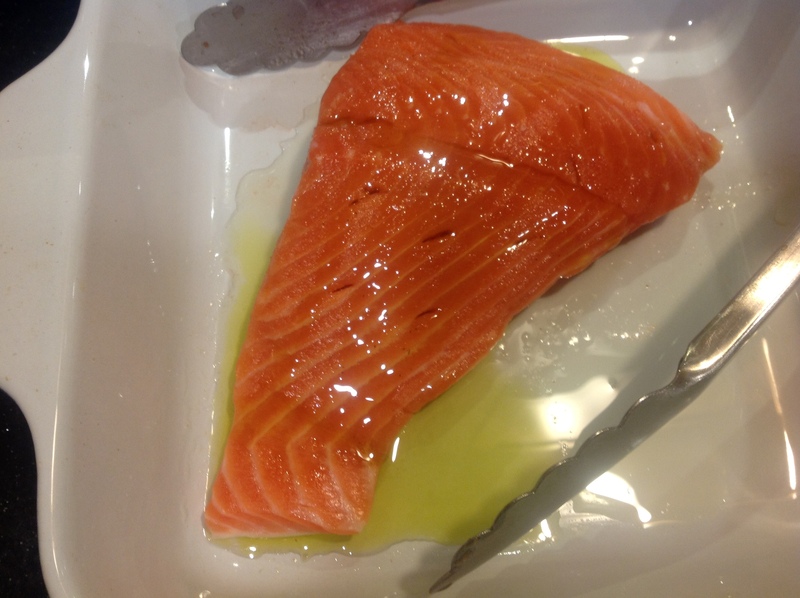 Now spread olive oil over the fish, then lemon juice, taking care to drive some of the salty, oily, lemony mixture into the deep cuts you just made (now you don’t need to wonder why you made them). Next comes the spice powder. I use it liberally to coat the fist. Perhaps a tablespoon and a half for a piece this size? The point is really to cover the flesh. Goes into the oven next. I give it 20 minutes in a 425 F oven, and it comes out medium-well. Your mileage may vary. This goes very well with patty-pan squash mashed (squashed?) but the recipe for that will come later. I’d like to invite you to join our site http://www.easyrecipes.com . I really enjoy your blog and recipes and I think the over 8,000 unique daily visitors to Easy Recipes will too. By joining Easy Recipes, we will provide the Nutrition Facts for every recipe you post in which you could customize and add to your blog. Viewers need and love to know the nutritional facts. Its a free service that we offer to blogs and recipes we really love. It looks professional and your members will love it. Simply visit http://www.easyrecipes.com or contact me at michelle@erecipe.com. We look forward having you in our network!